We’ve said it many times before and we’ll no doubt say it again: Typical homeowners insurance does not cover flood damage. This is one of the biggest consumer misconceptions we hear – and a painful, costly lesson to learn by experience. You need a separate flood insurance policy to be covered – and your policy must be in place for at least 30 days to be in effect, so a last-minute purchase when you hear about flooding potential would be too late. September is National Preparedness Month, and in this first week, the emphasis is on flood prep – so it’s a good reminder. Now if you have water in the cellar from a burst pipe or some other household failure, your homeowners insurance may cover your flooded basement damage. But for storm-related, flooding damage, you’d need flood coverage. 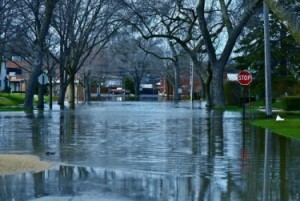 Here’s a listing of what is typically covered in a flood insurance policy. In the past 5 years, all 50 states have experienced floods or flash floods; Flash floods often bring walls of water 10 to 15 feet high. 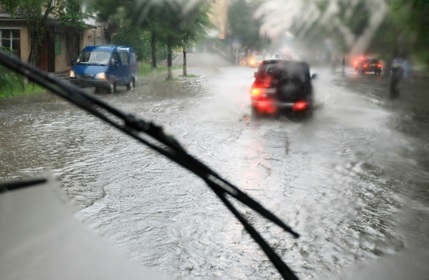 Learn more about your flood risk and get an estimated coverage cost. If you don’t have flood coverage, it’s time to talk things over with your independent insurance agent. Rain is great for spring growth, particularly when so many parts of the country are experiencing drought, but it would be nice to have the rain is more measured amounts! It’s pretty soggy right now and rain may continue off and on through this evening. Here are some heavy rain & flooding resources, tips and safety notes.